This paper examines the federal/ provincial jurisdictional obstacles to a national child care strategy that arose in the 1990s, and whether the obstacles can be overcome. After examining the three failed attempts to secure a national child care strategy in the decade between 1984 and 1995, it analyses child care within the concept of the "social union" that began to be debated as the federal role in social programs waned in the 1990s. 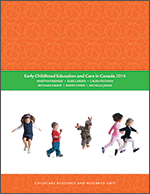 Suggesting that federal leadership is necessary for the success of a Canadian child care strategy, it evaluates the Social Union Framework Agreement of 1999 in some detail, proposing that the agreement's principles and stated objectives create not only a new imperative for a national child care strategy but provide opportunities for implementation. It suggests that under the Social Union Framework Agreement, both the federal government and the provincial/ territorial governments have appropriate roles to play in child care.
? What is this paper about?
? What does a national child care program mean: Who does what? 3 The Social Union Framework Agreement: A race to the top?
? The challenge: "Thinking outside the box"
? Is child care a canary in a coal mine?